From gangster to rock star, you'll look like a tough guy with a fake cig in your mouth. 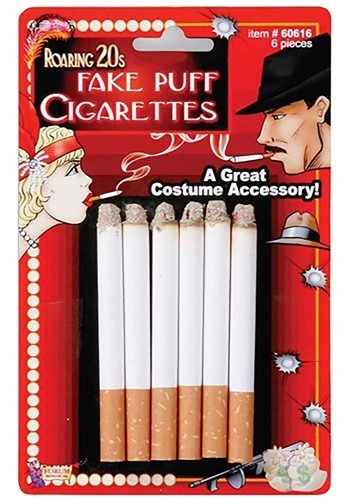 Trust us, you're going to want a box of Fake Cigarettes to complete your look. It's okay, in the 1920s people actually thought smoking was cool. Since we now know that smoking isn't all that cool and actually has some pretty nasty side effects, a fake cigarette is just what you need to complete your look without having to shell out your hard-earned money on a pack of the real thing. You also get to avoid smoking everyone out with your second-hand smoke. The best part about these fake cigarettes? You can use them inside or outside - no need to put it out when you walk into your 1920's party! The perfect complement to any flapper-era costume or even a 1950s look. In the case, a little bit of cash goes a long way for giving you an authentic look.